- in the garden of your cabin or home! At the home, take a break from the small household chores in the warmth of your own sauna. The everyday electric sauna gives way to a wood-burning outdoor sauna or lakeside sauna. 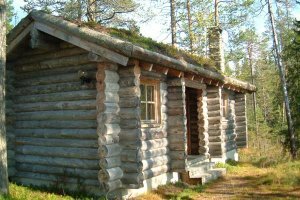 A private cabin is not an option for everyone, but you can indulge yourself and your family with a "trip to the cabin" by building a log sauna in the garden of your home. A wood-burning stove, water carried in buckets, a barbeque meal after the sauna, ahh... the joys of life at home! But what's best of all, you can get a good night's sleep in your own bed. At the bottom of this page there are images of saunas we have built in Finland and in Europe. We can build you a fully customized sauna as far as size, shape and fittings are concerned. Contact us and let us know of your wishes, and we will help you to have a sauna of your dreams.